When A Historically Black University's Neighborhood Turns White The area around Howard University was once working-class and black. 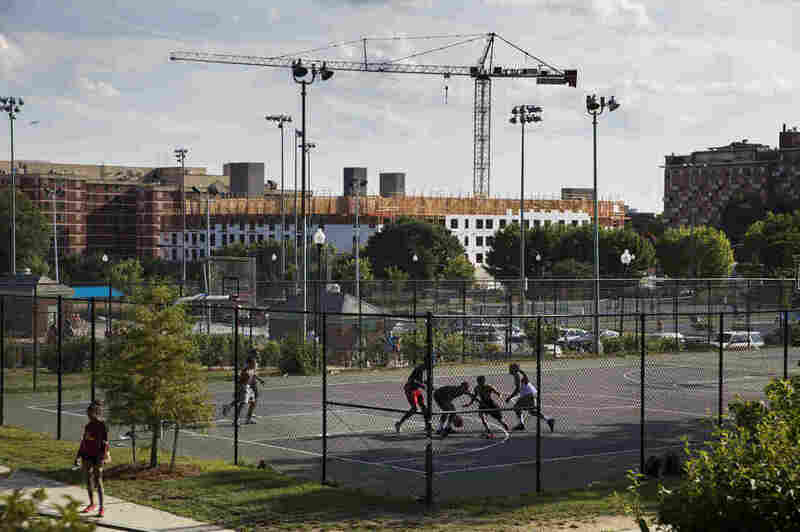 As more nonblack residents move in and property values rise, the D.C. university is taking advantage of the hot real estate market. 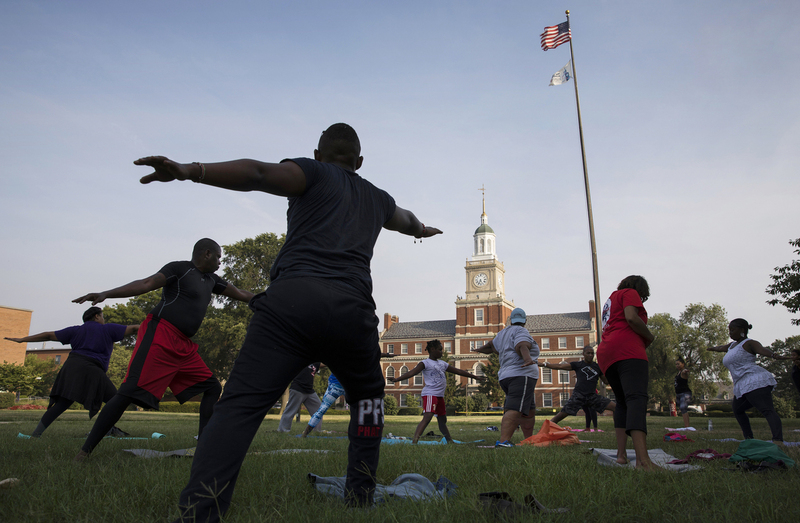 Participants stretch during a "yoga on the yard" class, one of Howard University's sesquicentennial celebration events that was open to anyone in Washington, D.C., who wanted to attend. The university is trying to foster better relations with the surrounding community. Howard University, one of the nation's top historically black colleges, has seen the neighborhood around it change drastically over the years. The area, located just a couple of miles north of Capitol Hill, was once working-class and black. But as hundreds of new residents move to D.C. each month, more nonblack residents move into Howard's neighborhood. And as property values rise, the university is trying to capitalize on the hot real estate market. For years, there was little interaction between the residents of the neighborhood and the middle-class students and faculty of the university. At times, the relationship wasn't always harmonious, despite a shared cultural experience. I went to Howard and have awesome memories about my time at "the Mecca." I met my wife there, and I even saw Jay Z perform at homecoming in 2000. But something else happened while I was there. One night I was with 10 of my friends walking home to our dorm, when two men from the neighborhood popped out of the shadows with guns and robbed all of us. Another time, at an off-campus frat party, a football player got stabbed in an altercation with some guys from the area. The neighborhood around the university's campus then felt much rougher than it does today. That is because crime is actually down in the area around Howard. The police department reported about 7,700 total crimes in D.C.'s third district in 2000, compared with just over 6,000 in 2015. The glut of liquor stores and rundown properties that dotted the area have given way to more bike shares and coffee shops. In 2000, the area around Howard was just 3.6 percent white. In 2015, white residents accounted for more than a quarter of residents, according to the Census Bureau. At one of those newer coffee shops, with a large black and white painting of Albert Einstein on the back wall, I met Jocelyn Lederman. She talked about what her neighborhood was like when she bought her condo just a few blocks from Howard University in 2010. "Catching a cab was nonexistent when I came here. I had a lot of cabdrivers ask me if I was single and that I shouldn't live over here and that I should move," Lederman said with a slight chuckle before adding: " 'Oh, thank you for your opinion, I don't care.' "
Lederman is white, a real estate agent and in her early 30s. 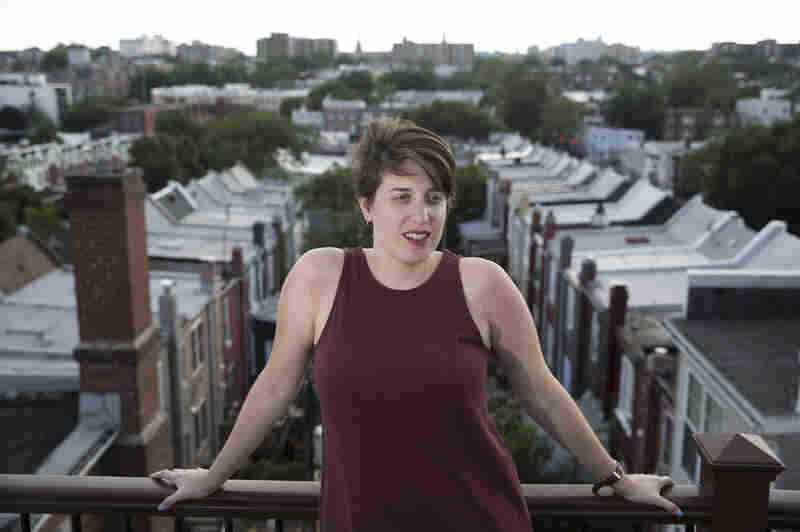 Originally drawn to the area around Howard for its proximity to public transportation — and her condo's rooftop deck from which she can see much of residential Washington — Lederman said she didn't know much about the neighborhood before she arrived. Since moving in, she has come to learn about the history of the neighborhood and the university. "I love being around a college campus. I hear the clock tower in the morning so I don't even have to look at my clock to see what time it is. Seeing the students go around is nice, and I also hear the drumline in the fall," Lederman said. But unlike Howard's band, residents and the university have not always been in lockstep, according to Maybelle Bennett, who is the director of the Howard University Community Association. "The relationships with the community had been relatively schizophrenic," Bennett said. On the one hand, Bennett said, residents were proud of the university's academic accomplishments, but on the other hand, they viewed Howard as insular and at times a lousy neighbor. Bennett, who has been at Howard since 1991, remembers getting earfuls from residents back in the day about the university being "cavalier" about the upkeep of properties it purchased in the 1970s and '80s outside the main campus. Those purchases were made as part of a planned expansion of the campus — in particular the Howard University Hospital — but never fully materialized. "Howard needs to clean up its own backyard; Howard needs to fix up these properties. Before I even got here, I had heard the same complaints," Bennett said, thinking about what she heard at community meetings in years past. In the late 1990s, when Howard began to address some of its neglected properties, in particular in the LeDroit Park neighborhood, another point of contention surfaced. Howard was helping to attract the gentrifying forces now present in many of its surrounding neighborhoods. "So now that we were doing it, it was damn if you do, damn if you don't because of the rise in value and the rise in tax bills," Bennett said. Darren Jones is a lifelong resident of the Pleasant Plains area of the district also serves as president of this neighborhood's civic association. He has deep roots here, so much so that there is a family photo of his mother and siblings when they were children on a historical marker in this community. On a walking tour, Jones, 57, pointed to the ever-present signs of change in the neighborhood. Darren Jones, president of the Pleasant Plains Civic Association (center), talks with neighborhood residents Nikki Shedrick and Dave Bobeck. Jones grew up in the neighborhood and has concerns about rising home prices and longtime residents' ability to stay in the area. Strolling past a group of mostly black teenagers playing a pickup game of full-court basketball at Bruce Monroe Park, Jones reminded me this was formerly the site of an elementary school and the future site of mixed-income housing. Not everyone is happy about that, of course. Around the corner is an eatery that opened last year, the Hilltop Bar & Restaurant, which pays homage to both this neighborhood's location situated on one of the highest points in the city as well as Howard's student newspaper, The Hilltop. On Hobart Place, a 10-minute walk from Howard's campus, row houses pop with colors so vivid some belong in a bag of Skittles. Even pothole-ridden alleyways get new brick pavers. While Jones is happy that his neighborhood is beautifying, there is worry that all these changes are hurting many of his longtime neighbors. "There are conversations being brought up all the time. Some of my elderly neighbors are talking about not being able to pay their taxes anymore," Jones said. Several condos in the area are springing up in the neighborhood with starting asking prices in the $700,000 range — or 10 times what Jones paid for his home in 1993. If property values keep rising, Jones is concerned that his adult son, who lives in the neighborhood, too, will be forced out like many of his older neighbors. "I'm afraid for my son because he grew up in this neighborhood and he would like to stay," Jones said. "His assessment is going to go from $400,000 to, well, maybe not $700,000, but something much higher. But the city is going to say your house is worth what the house is worth next door, which is not true because we can't sell it [for] $700,000." Jones said he is thrilled newcomers see the beauty of his neighborhood. He just wishes newer white residents weren't starting bidding wars for houses, pushing up tax rates and forcing many of his longtime neighbors out. Maybelle Bennett, the university's outreach director, said Howard is trying to help the neighborhood — and itself. Construction of the Sherman Avenue Apartments, a Howard University co-project, rises above the courts of the Banneker Recreation Center. Though this development will include some affordable housing, it could also spur further gentrification. Average home prices in D.C. rose higher than anywhere else in the country in the past year, according to the Federal Housing Finance Agency. And that is just the latest spike in a steep climb — house prices are up 423 percent since 1991. Howard, which celebrated its 150th anniversary this year, has had some serious financial issues over the years, including some $750 million in overdue repairs to campus facilities. So one solution is to capitalize on the hot real estate market. The university has leased a plot of land to a developer where the construction of a 319-unit complex is underway. Some amenities include a yoga room and a vegetative green roof. About 10 percent of the units will be offered at 80 percent of median income and another handful will be set aside for those associated with the university. Bennett knows this will likely draw more white people to this area of Washington. "And so what does that mean our neighborhood will look like? It is going to continue to be diverse," Bennett said. "It is going to continue to bring in people who do not necessarily look like us. And we are going to continue to have to find respectful ways of working with them, so that we can stay alive."